No weekly menu this week because…we’re on vacation! I can say this much so far about our Scottsdale, AZ babymoon – we have not been disappointed. I’ll gush more in another post, but for now, we’re kid-free (with the exception of the one I’m growing) and loving life. The dietitian in me throws most all of what I know and believe about nutrition out the window while on vacation. I mean, CAMPFIRE PANCAKES, people – graham cracker, marshmallow, and chocolate?! They were heavenly. It’s not worth trying to behave on vacation – it’s a time to focus on balance. Me: Let’s split something sweet and something savory! Me: Ooooo! Crabby Cake Omelet! Hubby: That sounds good, pick the sweet dish, too. In total, even after a day at the pool and no formal workout, I clocked over 10,000 steps on my FitBit. No, I’m not breaking any records, but we opted for walking over driving in everything we did yesterday. With our brunch meal, we also skipped right on by breakfast and went straight for dinner (except I did have an apple mid-afternoon). At home, I follow some of the same mentality, but not on a daily basis. There are times our meals are not dietitian-endorsed but those times are not every day, or even every week. 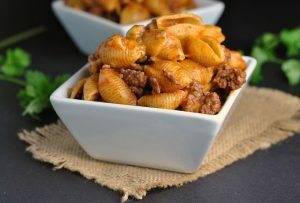 Sometimes I just come across a recipe and think how well my family would enjoy it, or more likely as of late, “Oooo…that sounds SO good!” and then I can’t stop craving whatever food it is. I think we call this a pregnancy craving. With this particular splurge of a meal (a little higher in calories than I aim for, far higher in sodium than I’d like, and higher in carbohydrate than most meals I serve), it contained my favorite pregnancy craving: deli meat! You always want what you “can’t” have, right? Easy to make and packed with flavor, these had to be shared with y’all. They’re just so darn delicious with the sweet and savory combination (like my brunch yesterday!) 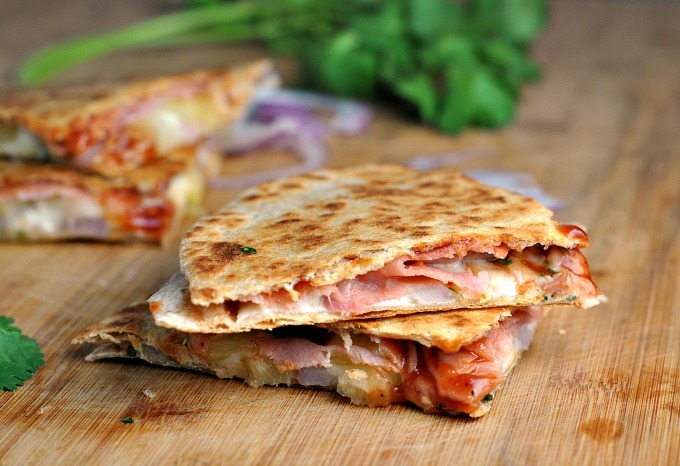 that makes the Hawaiian-style pizza one that people love and adore…and recreate in quesadilla form! Enjoy! 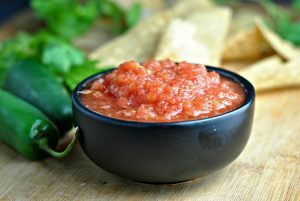 Lay 4 tortillas on a flat surface and brush each with 3 tablespoons BBQ sauce. 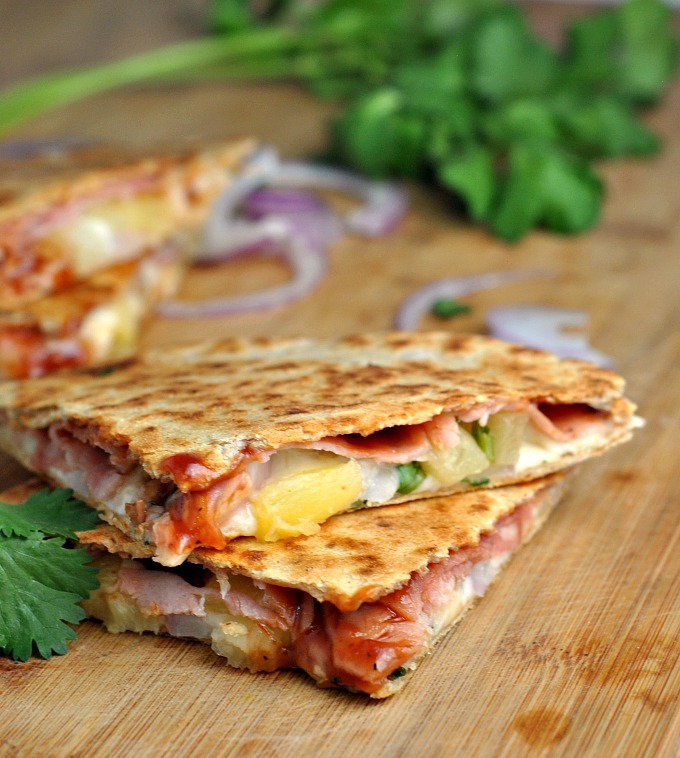 Next, layer ham, pineapple, red onion, cilantro and cheese. 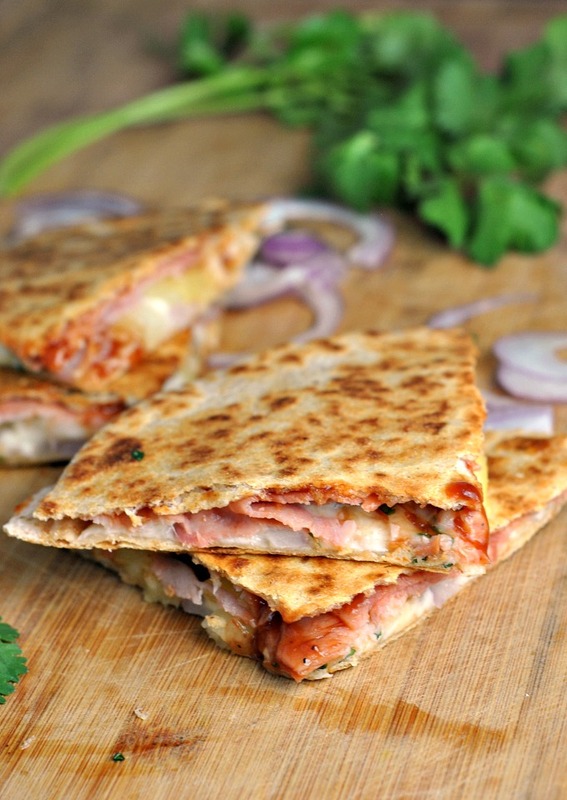 Mist hot griddle with non-stick cooking spray and gently transfer prepared quesadillas to the hot griddle. Cook 3-5 minutes or until golden and cheese begins to melt; flip and cook an additional 2-4 minutes. 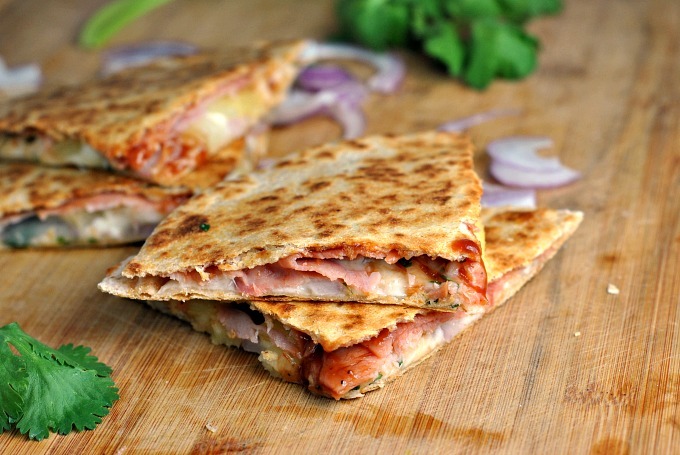 Remove quesadillas to a cutting board and allow to cool for 1-2 minutes. Using a pizza cutter or large knife, slice into pieces and serve warm.